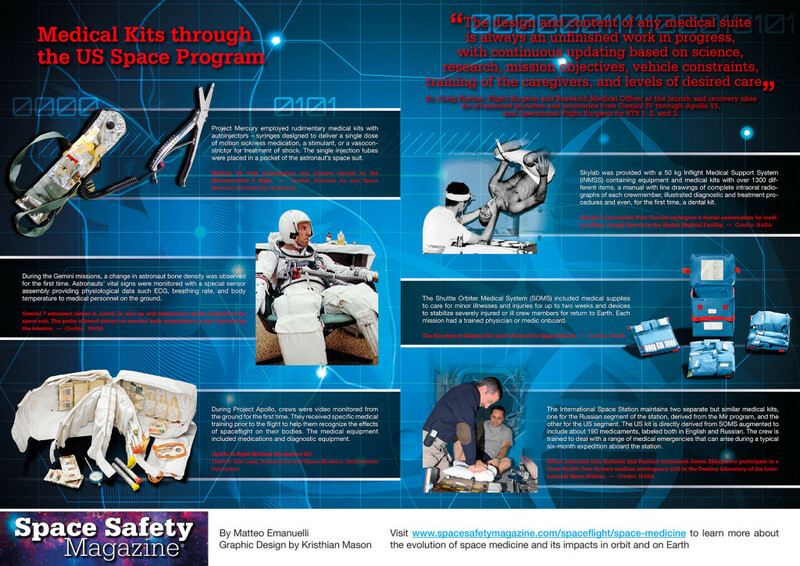 Space Medicine is a branch of medicine born in the 1950s to support human space exploration. At first it dealt with the immediate impacts of microgravity on human physiology. As flight durations increased, so did understanding of longer term effects due to microgravity, radiation, and isolation. Medicine in space, like medicine on Earth, progresses step by step along with spaceflight capabilities to test the limits of our understanding and our bodies. At the dawn of the space age, the fast pace of space activities left very little time to develop a medical basis for the human space program. Concepts such as life support, safety, and health were addressed on an a priori basis and were mainly founded on already established aviation medicine. Astronauts were military test pilots, a natural choice since the space race was driven mostly by political reasons. Later, doctors and scientists were introduced to provide medical expertise onboard and to conduct experiments. The first of them to be selected, in 1967, was Story Musgrave who flew six Space Shuttle missions from 1983 to 1996. Space medicine had to evolve quickly to support the presence of human beings in space – an environment for which humans were not designed. Evidenced-based medicine, lessons from research, and clinical experience were the principal drivers behind the never-ending effort to secure astronauts’ lives and understand how the space environment influences human physiology. Hubertus Strughold was the first to coin the term “Space medicine,” in 1948. Strughold was a former Nazi physician and physiologist brought to the US after World War II as part of Operation Paperclip with, among others, Werner von Braun and Arthur Rudolph. Strughold became the first professor of Space Medicine at the School of Aviation Medicine. He was later made director of the Department of Space Medicine at the same institution, which is now known as the US Air Force School of Aerospace Medicine, at Brooks Air Force Base, Texas. After his death, Strughold, who played an important role in developing the pressure suit worn by early American astronauts, was connected to war crimes committed in the Dachau concentration camp and stripped of most of the honors acquired in his life. Motion sickness was the first condition to be treated, but as mission lengths increased more health conditions had to be taken into account. Astronauts needed to be not simply healthy, but also alert and responsive. During the Mercury-Atlas 9 flight, the last of the Mercury Project flights, astronaut Gordon Cooper took dextroamphetamine sulphate, a potent stimulant also known as a “go-pill.” The pill had been made available both in the spacesuit and in the survival kit, but Cooper was the first to try it during a flight. Unfortunately, common sicknesses followed the first space explorers. When the duration of spaceflights became the International Space Station (ISS), passing through Gemini, Apollo, Skylab, and the Space Shuttle programs. For each program, the medical kit was adapted to the crew size, scheduled activities, and duration of the mission. Musgrave, when he was not flying in space, provided also his expertise as medical doctor to design medical equipment for the Space Shuttle program. The medical kits that have flown through the years on every manned mission are clear examples of space medicine’s evolution from a few drugs to complex diagnostic devices and tools to treat the majority of the conditions that can happen while in orbit. 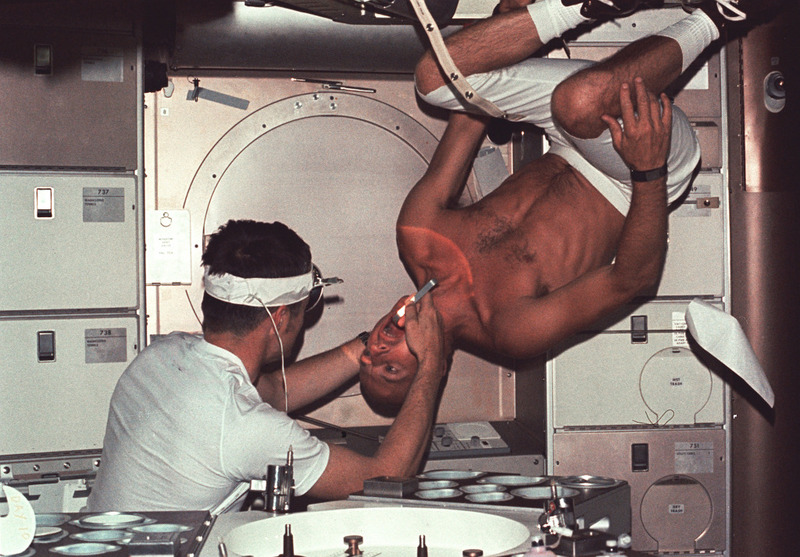 Skylab 1 commander Pete Conrad undergoes a dental examination by medical officer Joseph Kerwin. – Credits: NASA. Current space medicine still relies on the possibility of returning home within a few hours; ISS is not equipped with facilities to conduct surgical operations in microgravity or with advanced diagnostic machines like those found in most hospitals here on Earth. Zero gravity, power requirements, and size are the most important limits preventing the direct transfer of medical technology from ground applications to orbit. These same restrictions create incentives to find innovative solutions. Efforts are now directed towards miniaturization, teleoperated surgical robots, and new technologies to decrease convalescence time and to prevent infections in support of today’s low Earth orbit outpost as well as future human planetary missions. 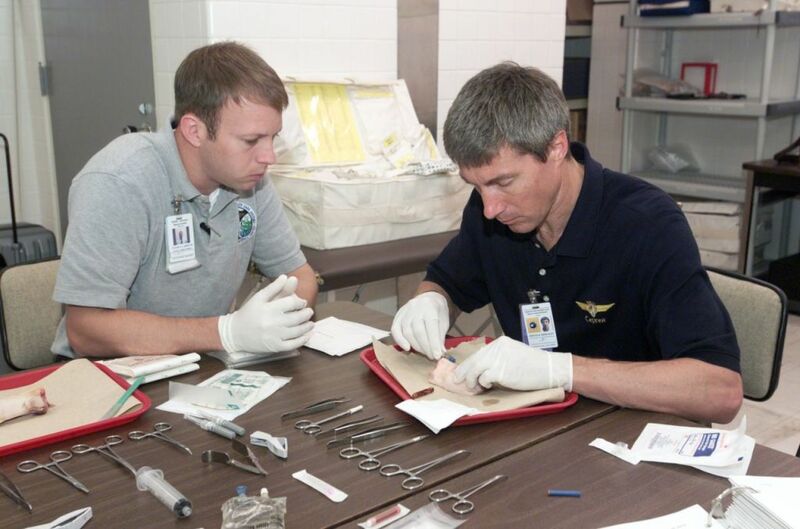 Space medicine instructor Tyler N. Carruth assists cosmonaut and Expedition 11 commander Sergei K. Krikalev in a medical training at Johnson Space Center (Credits: NASA). Virtual Incision (VI), a startup company founded in 2006 and based in Lincoln, Nebraska, has developed a fist-sized robot in conjunction with NASA that may be able to perform abdominal laparoscopic surgery on astronauts. The robot has two arms equipped with various tools to grab things, suture tissue, and cauterize wounds. A camera on top of the robot provides feeds to a control station where a human surgeon controls the procedure using joysticks. In space, even straightforward operations can be problematic since bodily fluids in microgravity could easily contaminate the module environment. In order to make possible surgical operations in space, researchers at Carnegie Mellon and the University of Louisville in Kentucky developed the Aqueous Immersion Surgical System (AISS). “AISS is a transparent box that creates a watertight seal when it is placed over a wound and pumped full of sterile saline solution,” George Pantalos, professor of surgery and bioengineering at the University of Louisville told New Scientist in 2012. The saline solution is held under pressure inside the AISS to prevent blood from seeping out of the wound. Airtight holes allow doctors to access the submerged wound using handheld instruments. The system can also be used to siphon and recycle blood by varying the pressure, which will be important for human space exploration as it is unlikely that future missions will be able to carry a blood bank. -In the video below: how do we handle medical emergencies in space? Space affects microorganisms such as viruses and bacteria as well as humans. Microgravity has been shown to increase the virulence of such organisms, increasing microbial growth rates, antibiotic resistance, microbial invasion of host tissue, and genetic changes within the microbe. Even the space modules on the ISS are not significant, astronauts had to carry with them medicines to treat congestion of the upper respiratory tract, diarrhea, and fever. Drugs were intended mainly for contingency situations most likely to arise during the flight. The Apollo crews suffered various sicknesses, minor diseases, and other problems such as upper respiratory infections, viral gastroenteritis, fiberglass irritation, dermatitis, sleep difficulty, and the inevitable motion sickness. The only medical condition that was not treatable onboard was a case of transient arrhythmia during Apollo 15. Later, during Skylab and the Space Shuttle program, trained physicians joined the astronaut corps, greatly enhancing the diagnosis capability and on-orbit medical research. The progression of space medicine is reflected in the equipment and tools carried onboard spacecraft throughout immune to microorganisms. Antibiotics and other drugs will have limited effectiveness on long-duration missions simply because any stocked medications will likely expire before a mission concludes. After undergoing a surgery in space, it would be very important for an astronaut to recover as soon as possible to avoid dangerous infections due to increased virulence of microorganisms. How can this be achieved without antibiotics? Cold or non-thermal plasma could definitely do the job due to its exceptional sterilizing capacity. Cold plasma was found able to kill the vast majority of bacteria and to increase the rate of wound closures in laboratory conditions. In 2005 Mounir Laroussi, professor of Electrical and Computer Engineering at Old Dominion University, invented a 12 centimeter long portable device called a plasma pencil that produces a short plume of non-thermal plasma, able to operate for eight hours at a time. Although researchers have yet to discover the mechanism behind the effectiveness of cold plasma and its long-term effects, it appears to be a fundamental technology for future space medicine. 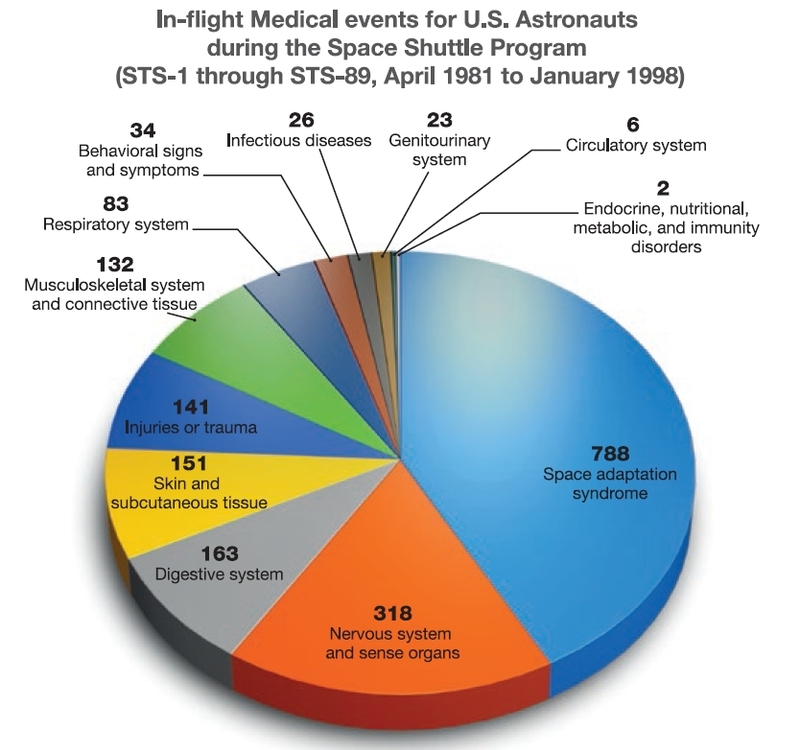 In-flight Medical events for US Astronauts from STS-1 through STS-89 – Adapted from Safe Passage: Astronaut Care for Exploration Missions (Credits: Institute of Medicine). Before undergoing any surgery, whether on Earth or in space, diagnosis is always the first step to understand the medical situation. To provide a diagnosis device suitable for space, researchers at the University of Saskatchewan, Canada, have developed a compact Magnetic Resolution Imager (MRI). The machine is capable of producing detailed “sliced” images of human bodies or their parts, just like a conventional MRI. But whereas the conventional MRI weighs about 11 tons and costs about $2 million, the mass of the compact MRI is less than 1 ton and costs only $200,000, making it much more space- and cost-effective. Since the compact MRI relies on a permanent Halbach magnet, which is much lighter than the traditional superconducting coil, it does not create any detrimental interference with the electronic equipment aboard a spacecraft. Zero-gravity, power requirements, and size limits prevent the direct transfer of medical technology from ground applications to orbit. However, these same restrictions create incentives to find innovative solutions. In order to support not only the current low-Earth orbit outpost, but also and especially future human planetary missions, efforts are now directed towards miniaturization and teleoperated surgical robots as well as new technologies to decrease the time of inactivity after an operation and prevent infections. The scientific research conducted in space can greatly contribute to find effective vaccines for diseases on Earth. Terrestrial medicine has been improved by some specific applications of space technologies: robotic arms able to berth SpaceX’s Dragon to the ISS, if miniaturized, can successfully operate a brain tumor and space-grade material can contribute to a Paralympic record. Great improvements are still necessary, to fully support human life in space, however, space medical research has greatly fostered the development of medicine on Earth for the benefit of everyone.